Welcome to Cabins on Bearpen Creek! Located less than an hour from downtown Dallas, Cabins on Bearpen Creek is the perfect location for a weekend get away and more. Just minutes away from some of North Texas’ most sought after wedding venues: Big Sky Event Hall, Poetry Springs, White Sparrow, and Occasions at Stone River. These unique cabins, in the thick woods of Hunt County, are the perfect location for retreats, corporate meetings, picture venue, wedding night or just a place to get away. 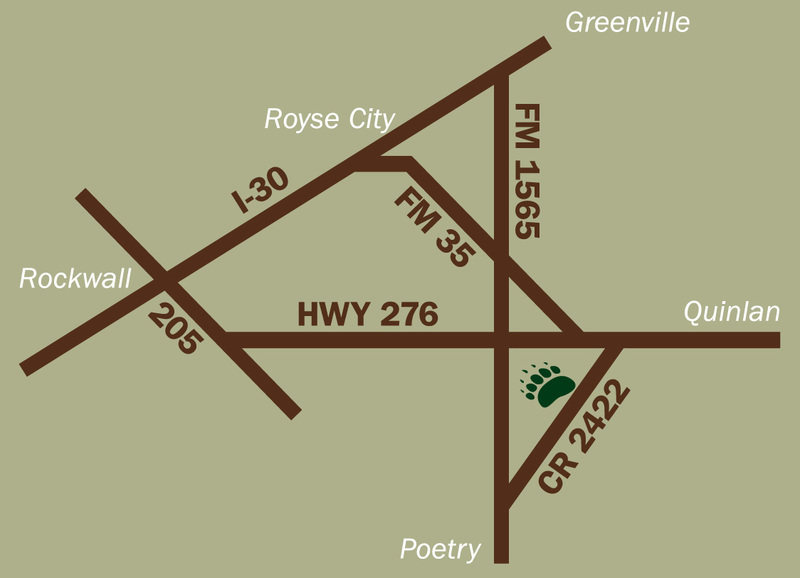 You can find us in Union Valley, Texas; very close to Poetry, Royse City, Terrell, Quinlan, Rockwall and Greenville. The cabins are conveniently located near the shores of Lake Ray Hubbard, Lake Tawakoni and not far from Lake Fork as well. We partner with local wedding venues, churches, local businesses and horse arenas to provide overnight arrangements for their guests. Choose from one or two bedroom cabins, each with it’s own unique personality. Cabins on Bearpen Creek is situated on 9.8 acres which is heavily wooded and full of wildlife with Bearpen creek running through it. Just off Hwy 276, Cabins on Bearpen Creek is easy to locate yet it’s still quiet enough for pure relaxation and enjoyment. Each cabin has it’s own theme and charm, from victorian to modern to rustic, located on the edge of the pond or hidden in the trees. Sign up to be on our email list. We’ll keep you in the loop about what’s happening at Cabins on Bearpen Creek! © 2018 Cabins on Bearpen Creek - Marketing and Website by Winegard Media.